For many home owners the Kitchen is the heart of the home, a place to gather for meals, entertain guests and rustle up some hearty grub. A lot of you will enjoy baking too, displaying pots, pans and baking utensils hung along the wall or neatly stacked on shelves. A bakers paradise needs to be bright and airy, with room for rolling kneading and whisking. There also needs to be enough light, particularly when baking, concentration and precision is key so don’t strain your eyes when measuring out your flour or reading that old faithful recipe book. Today we’re going to help you create the perfect pancake parlour, ready for Pancake day. There are so many areas in the kitchen that will benefit from some illumination. Glass fronted cabinets, under worktops, breakfast bars and dining areas all need illumination for a safe and functional Kitchen. There are two main types of lighting that work best in the Kitchen. Task lighting for areas such as the worktop, cooker or preparation areas and ambient lighting to set the mood over the dining table and entertainment areas. For focusing light onto specific areas of the Kitchen such as a calendar or shopping list board you will need spotlighting. Choose from small single spotlights that will sit snug into most spaces such as alcoves and forgotten areas of the Kitchen. Dot them around the Kitchen to add direct illumination to worktops. Alternatively, if you require a bigger scale of light then choose a plate or bar spotlight fitting. These fittings work in the same way as single spotlights, they can be angled and adjusted, rotated and tilted to shine light onto a specific area. Our new Idyllic Spotlight Range would work perfectly in a country style Kitchen. Featuring a rustic distressed white finish and cut out detail, this range ads a more traditional style to what is usually a contemporary design. This range includes a single wall light, 3 light plate and a 4 light bar option for ultimate illumination. If you prefer the minimal look and would rather your lighting scheme be neat, streamlined and compact then choose Recessed down-lights instead. These little gems do exactly what they say on the tin, a deep set single light with a direct focus spot of illumination. 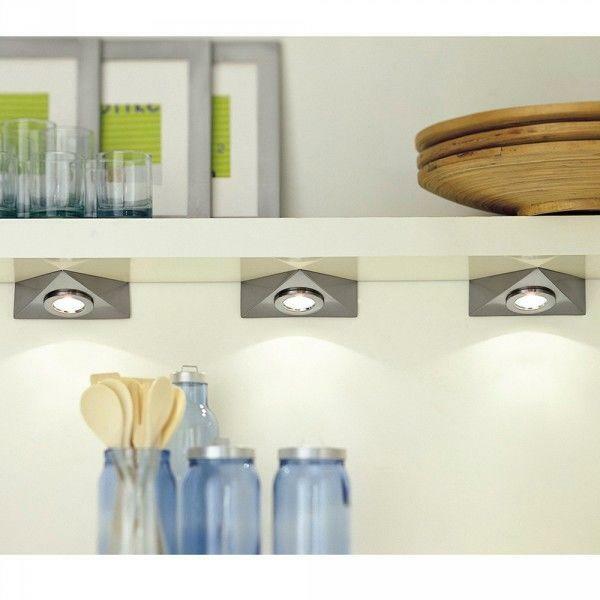 The recessed element allows for a clean and neat installation, a smooth and seamless practical Kitchen lighting option. Litecraft stock a wide range of recessed down-lighters in a range of colours and finishes. For an airy clean finish we’d advise to go for a white or opal surround. Our Philips Pack of 3 Sculptor LED Recessed Downlights in White feature a super-slick LED bulb design on a simple round surround. 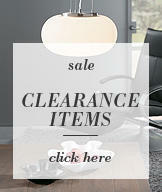 a simple push mechanism adjusts the light to exactly where you need illumination,. Alternatively opt for our budget-friendly 3 Pack of Recessed Downlighters in White. Under cabinet down-lights are also available for a closer worktop illumination. Designed to sit snug against your wall and cabinet, these handy gadgets will give a soft glow and soothing ambience along your Kitchen surfaces. 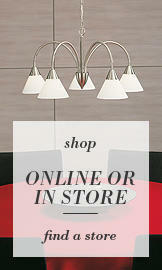 Try our Delta Under Cupboard Down Lights. Now we’ve covered the Kitchen area, you need to look at illuminating any other surfaces in the room. These days it’s not unusual to have a breakfast bar or dining table combined with the Kitchen. So make sure you make the most of this space with the right light fittings. The best style of decorative and practical Kitchen lighting has to be pendant fittings. A single light suspended from the ceiling, these are ideal for high ceiling homes but rise and fall options are available for smaller spaces. Industrial lighting was a big hit last year with raw, stripped back styles taking centre stage. This year the look is still prominent with cage-like designs making a big trend statement. We’ve two cage style designs to show off today, our ever popular Joshua Easy to Fit Cage Ceiling Shade in Cream combines country cottage style with industrial design, boasting a cream enamel shade and metal mesh grille cover. Whilst our Haddon 1 Light Cage Pendant in Brown focuses on a more exposed and stark style with a metal bar cage shade in a matt coffee finish. Add even more industrialism by fitting the light with one of our Squirrel Cage Bulbs. Our gold tinted options give a vintage edge to any light fitting. Check out our post on our decorative range bulb here. As explained earlier, pendants are designed more for homes with higher ceilings. However, a rise and fall option can work well in both high and low ceiling homes. These fittings include a stylish pulley mechanism allowing the pendant to be lowered for dining then raised out of the way when not needed. Choose our Fisherman Rise and Fall Pendants, available in Satin Chrome or Cream for a country cottage style or choose our selection of Rise and Fall Units that can be attached to any shade allowing the height of the fittings to be adjusted to suit your needs. You may feel limited to just one light, but don’t fret, there are multi-pendants available which can double, triple or even quadruple the amount of light on your breakfast bar or dining table. Fittings such as our Philips InStyle Shady 3 Light Suspension Light in Grey feature 3 shades on one fitting. 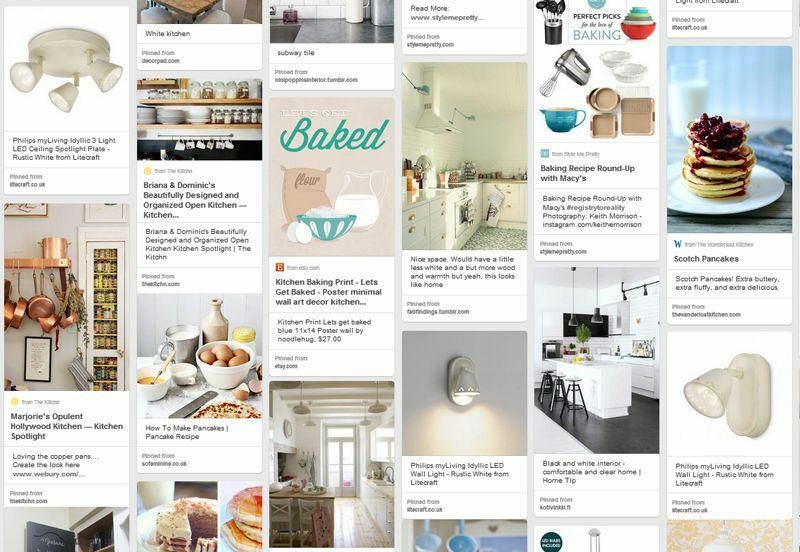 For more kitchen lighting and interior inspiration check out our Perfect Pancake Parlour Pinboard.